I've never been a big fan of the company. Sure, they have pretty much everything, but I've always thought their website was somewhat frustrating, with the third-party sellers and all. And then. I got a free trial of Amazon Prime. And my life was changed. Throughout December, I just kept buying things from Amazon - Christmas gifts, things I needed for school, random stuff I wanted... the list goes on. Now, I'm officially a huge fan of Amazon! Today I'm sharing some of my favorite finds from the website - most of these are pretty random, but I hope you enjoy! Most of these items revolve around gifts that I gave or received for Christmas. I gave my mom two of these mini bundt pans, this Tile tracker, and this "Drop Stop" that prevents things from falling between your car seats. I also gave a Corkcicle coffee tumbler to my grandma - my whole family loves them. My dad gave me this shower speaker, this card game called Game of Phones (so fun! ), and this MacBook case (I also bought a marble sleeve to go with it!). A few other things are on my wishlist - this gorgeous pink letter board, this punny brownie pan, this bluetooth beanie that plays music (!!! ), and this Classic Style coffee table book. Okay, I know I featured a lot of products, but have I convinced you yet? Amazon is pretty amazing. 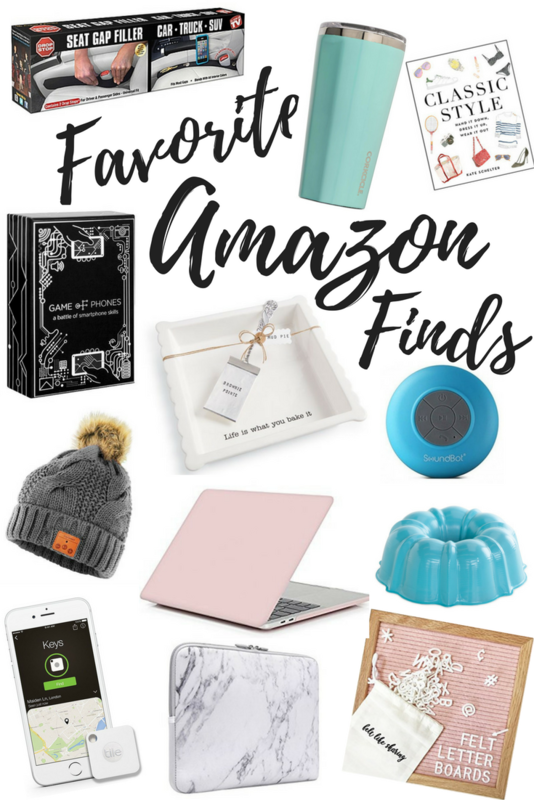 What are your favorite products to buy on Amazon? Let me know by leaving a comment below!